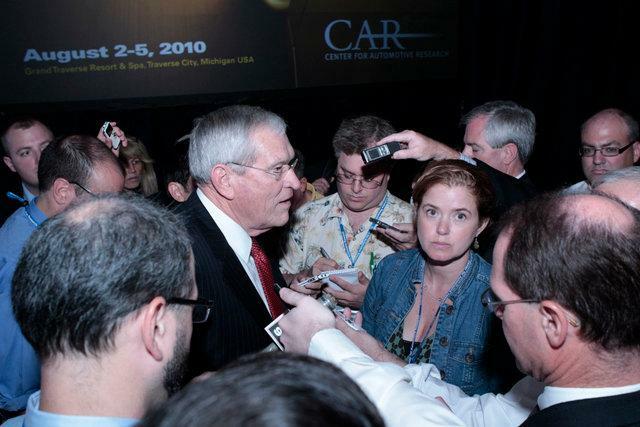 Reporter Sharon Carty looks in camera during a scrum with former General Motors Chairman and CEO Ed Whitacre. 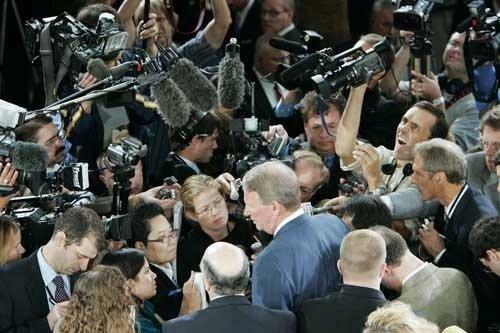 AP / Reporters gather around then-GM CEO Rick Wagoner during a scrum. For the average person, there's a lot of "wow" at the North American International Auto Show. But for reporters and auto company executives, that "wow" can sometimes be more like "ow." Especially during the impromptu, free-for-all press conferences that are known as "scrums." Problem is, nobody tells you what a scrum is before you attend your first Detroit auto show. They all wait until it's too late to back out. It's almost a kind of hazing. Here's all the warning they gave Alan Mulally, CEO of Ford Motor Company, minutes before he was to give his first product presentation at the North American International Auto Show in 2007. "Well, first we're gonna do the presentation, and then we'll do a scrum. And I asked, 'what is a scrum?' And they said, well, the reporters are gonna get all around you, they're all gonna stick their microphones in your face, and it's gonna get tighter and tighter and tighter, and the most important thing is that you keep breathing." That was good advice. One former GM executive once famously cried out, "I can't breathe!" during his first scrum. And yes, the ad-hoc ritual does seem crazy. But, try as people might to control the auto show, in the end, the show controls the people. Most auto company executives plan for the scrums. Some just happen. One reporter runs over to interview an executive after the presentation....everyone else doesn't want to miss out....and a scrum is born. Mulally wasn't the first nor will he be the last to ask: "Isn't there a better way to do this?" He was told, "no, everybody really likes to do it this way. " Many would beg to differ. Especially Sharon Carty, a veteran auto reporter and now Executive Editor of AOL Autos. "I hate them," she says flatly while taking a breather at the latest NAIAS. "I started with just a dislike of them - and it has grown into a fiery, passionate hate." Imagine, hating, being smushed up against the bodies of dozens of fellow reporters, trying to take notes while some guy's elbow keeps hitting you in the shoulder blade. Carty's had to endure these indignities through two pregnancies, in high heels. It doesn't help that, "When I'm in these scrums, it brings out some primal anxiety in me, and I sweat and I shake." Carty's scrum-hate is so well known that photographer friends take pictures of her in scrums looking miserable which she then posts on Facebook. But her biggest gripe about scrums is they're not really journalism. They're just to cover your back, "in case the executive said something that maybe was newsworthy. In case, maybe. And they never do." One of the best "my first scrum" stories comes from Dan Akerson, General Motors' CEO. It's not like he hadn't been through tough experiences before - he was in the military, after all. But the sudden onslaught took him by surprise. They came on Akerson so fast and furious that a camera guy knocked him in the face with his equipment. Akerson was afraid he'd have a black eye the next day. Stoicly, the CEO answered a few questions and then tried to leave the event. But he was surrounded on all sides by reporters, who refused to part. And guess what. It can get worse. Like Sharon Carty's worst scrum ever, a big one, where everyone was packed in like sardines. They pressed closer and closer, like starving seagulls all going after the same crumb. "And the man behind me started to ask a question, and I turned my head slightly to the left, and the guy was one of these spitters. You know, like just a lot of phlegm coming out of his mouth as he was talking, and it all just shot into my ear. It was just horrifying...... just horrible." Now I don't want to leave this on a down note. Carty and I had a long talk about scrums. And she finally admitted there is some good to them. You can ask just about anything - and whatever answer you do get, it's generally better than a canned speech or a press release. "So, yes, it's true," she deadpans. "Now you've talked me into it. I'm gonna go do a scrum right now. Just for the fun of it."